Alan McPherson is professor of history at Temple University and the author of A Short History of U.S. Interventions in Latin America and the Caribbean. 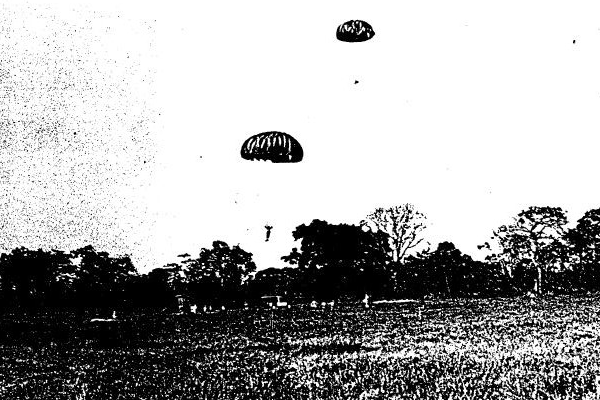 Cuban defectors practicing parachute drops to prepare for the Bay of Pigs invasion. The chaos in Venezuela has awakened the specter of U.S. military intervention. The U.S. government and several others have recognized the new president of the National Assembly, Juan Guaidó, as the South American nation’s legitimate president—a direct challenge to the rule of Nicolás Maduro. President Trump has renewed his vague threat that “all options are on the table” in dealing with Venezuela, including a U.S. invasion. Over the weekend he reiterated that an invasion was “an option.” But invasion should be off the menu. First, a U.S. military intervention would be illegal according to all the conventions of the Inter-American System. It would also lose us allies in the region and elsewhere, such as Colombia, Brazil, and Argentina, and it would reinforce the hostility Washington has already whipped up in Bolivia, Ecuador, and Mexico. Cuba would benefit as a defender of its neighbors, as would the Russians and the Chinese, who have never intervened or threatened intervention. Back in July, Rex Tillerson and H. R. McMaster pushed back with these arguments, and Trump seemed placated. Now that Secretary of State Mike Pompeo and National Security Advisor John Bolton have respectively replaced these more cautious predecessors, there are no grown-ups left in the executive branch to steer the president away from certain disaster. History can be a reckless teacher in this case, offering deceivingly clear lessons. Trump has compared a hypothetical move against Venezuela to the U.S. invasions of Grenada in 1983 and Panama in 1989. In the latter, Operation Just Cause kicked out strongman Manuel Noriega and garnered the approval of most Americans and even Panamanians, and democratic (though corrupt) governments have been in place since. In the former, U.S. troops ousted an extreme leftist government and restored democracy. Righteous cakewalks, right? But the lesson gets blurrier if we look at the entire history of U.S. military interventions. For all the talk of their frequency, a takeover of Venezuela would actually be unprecedented. Never has the U.S. military launched a full-scale invasion of a South American country. Its targets for almost all U.S. troop landings—usually Nicaragua, Panama, Cuba, Haiti, and the Dominican Republic—have been in the Caribbean and Central America. These countries were small, their militaries tiny and poorly trained and equipped. Rarely could they put up much of a fight. When they did, such as Fidel Castro’s Cuba in 1961, it was to repel an invasion supported by U.S. resources but manned by exiles, not U.S. military personnel. The same was true for Guatemala in 1954: The invaders were mostly Guatemalans and other Central Americans supported by the CIA. Washington likewise never attempted a takeover of Mexico. Yes, it took the northern half, but that was nearly two hundred years ago. And the troops, aware of the average Mexican’s hostility to them, marched on only part of the nation and left after scoring a quick victory. Decades later, U.S. marines and sailors took over Veracruz in 1914, but never left the city. The Punitive Expedition pursued Pancho Villa into northern Mexico in 1916, but never caught him and avoided a war against Mexican troops. U.S. war planners always knew that Mexico was too big to invade. Washington certainly did undermine South American leaders by supporting coup plotters—in Guyana under John Kennedy, in Brazil under Lyndon Johnson, and in Chile under Richard Nixon. But these were small-scale CIA operations or the mobilization of limited naval resources. None involved an invasion by the U.S. military. South American countries are larger, wealthier, and farther away than the usual suspects. Invading them would involve hundreds of thousands of U.S. troops, not thousands or even tens of thousands. Take Venezuela—figuratively, not literally. Panama and Grenada are no Venezuela. On the eve of Operation Just Cause, Panama had a population of 2.4 million and a U.S. military base in the Canal Zone. It took only 27,000 U.S. troops to immobilize the Panama Defense Force. Grenada was even more ludicrous. Operation Urgent Fury’s 8,000 forces took a mere two days to topple the Grenadians and even the Cubans who helped them, occupying an island of 110,000 souls the size of Martha’s Vineyard. Venezuela, in contrast, has 32 million people. Its military stands at over 235,000 strong, with 1.5 million pro-government militia members waiting to mobilize. Those are Iraq circa 2003-level numbers. Speaking of Iraq, Venezuela is twice its size and has a similar population. Like Iraqis, Venezuela’s patriotic troops wouldn’t just cut and run. Many would fight. And Colombia, Venezuela’s neighbor, doesn’t seem to want to send their own, though it looks like they would tolerate 5,000 U.S. troops. Do we really want an “Operation Venezuelan Freedom” that ends up costing hundreds of billions of dollars and thousands of U.S. and countless Venezuelan lives? Maduro himself likened an invasion to another Vietnam that would “stain with blood” the White House. Even if the initial invasion succeeded in deposing Maduro and installing Guaidó, a foreign intervention might destabilize politics there for a generation. Bigger countries are harder to rebuild after an invasion or an occupation. They have more political factions. They have more weapons. They have more places for the opposition to hide and regroup. And they generally are more nationalistic and thus able to portray those who collaborate with outside invaders as, well, collaborators. To be sure, some outside intervention may be legitimate. In our globalized world, the international community has the right—and the institutions—to override national sovereignty in extreme cases such as that of Venezuela today. It can demand that Maduro step down, and it can make use of a host of diplomatic and economic tools to compel him. And of course, an overthrow could come from inside Venezuela, the most likely outcome. But as Venezuelans of all stripes have said, a “gringo intervention,” even one that coordinated with the Venezuelan military, would invite death, destruction, and maybe even the perpetuation of Maduro’s nihilistic regime.